Saimax produces wide range of plastic bonding adhesives for wide variety of plastic assembly and repair. These adhesives are approved by OEMs and used in various plastics, composite and metal bonding applications. Panel bonding adhesive is widely used to bond non-structural automotive parts. Saimax has discovered highly effective panel bonding adhesive that comes in various applications for specific uses. It is a two-part epoxy that is used to bond aluminum, steel, traditional fiberglass, and SMC. 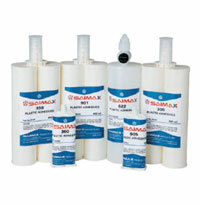 Browse the stock of different adhesives offered by Saimax. Sands to a perfect feather edge in 30 minutes or less. Surfaces: Finishing adhesive for all types of plastics including ABS, FRP, SMC, TEO, Urethane, Metton, Telene, etc. Applications: All purpose adhesive with excellent bond to Plastics and Metal surfaces. Finishing adhesive for all plastic bumpers and body panels. High strength with excellent gap filling properties. No primer or surface preparation needed. Used in wide variety of OEM applications. Surfaces: Bonding aluminum or bare metals to ABS, FRP, SMC, Acrylic, Polycarbonate, Carbon Fiber, etc. Applications: Ideal for door skins, hood scoops, Kemlite roofs-semi trailers, Corvette body panel installations, trailer walls, aluminum brackets to composite, headlight buckets. Ideal for heavy duty truck repairs. Surfaces: Bonds and cosmetically repair all kind of plastics. SMC and fiberglass to itself and primed metals. Applications: Designed for bonding SMC and fiberglass body panels including spoilers, wind deflectors, roofs, fender liners, large assembly of fairings, body panels, etc. Ideal product for all structural and cosmetic repairs on bumpers. Surfaces: Works on all plastic bumpers such as TPE, TPO, TEO, PP and ABS and also works on SMC and Fiberglass. Applications: Ideal for bumpers, bumper tabs, emblems, door trims, interior and exterior plastic repairs and cosmetic repairs. Meets Ford, GM and Chrysler’s SMC bonding specs and recommended in TSBs. Surfaces: Ideal for Carbon Fiber, SMC, Fiberglass, ABS and all other types of thermoplastics. 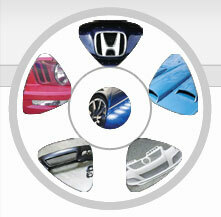 Applications: Installation and bonding of small body panels, spoilers, ground effects and headlight buckets.